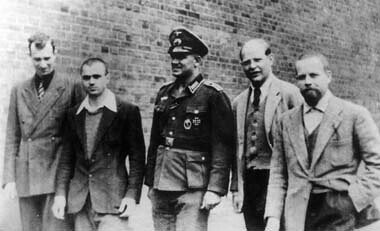 Bonhoeffer and Prisoners.jpg, originally uploaded by theologian75142. Like a Squire, from his country house. Am I really that which other men tell of? Am I one person today and to morrow another? This was written a few months before Dietrich Bonhoeffer was executed by the Nazis, (and that just a few days before his camp was liberated by Allied forces.) During College I wrote a paper on this poem, exploring the context in which it was written. After reading his letters from prison, accounts of life in the Nazi concentration camps, first-hand accounts of Bonhoeffer’s cell-mates, I was bugged and awed by how this guy lived his short life – some 30 odd years when he hit the end of that rope around his neck. Aside from the man, though are the words he wrote in this poem – they have lingered in my mind for years. Lately, they have taken on a new life for me. He knows very well what others say about him, and he asks if any of it is credible. He, also, knows very well what he says about himself, and, again, wonders if it is credible. Am I really that which other men tell of? Or am I only what I myself know of myself? What brought this poem home for me was when I realized how much I tell God who I think I am. And in the telling, expect him to respond on the basis of my presumptions. I have come before him in a clothing of sorts – the writer, the carpenter, the counselor – listing skills I have or don’t have that qualify me or not. Then one day, he silenced me with not listening at all to what I was saying, but poignantly telling me who I am in his eyes. The clothing came off and I was naked before him as he sees me. It caught me off guard because I didn’t know I was trying to lay claim to any identity at all. But when he started speaking, it was clear who knew whom. I thought I would convince him that I “deserve” more of something – be it punishment or entitlement – because I wear all these hats – abilities he gave, experiences he led, I started to believe my CV spoke more about who I am than what he already knew. Bonhoeffer eventually puts aside all other answers and ends with “I don’t know the answers, all I know is I belong to you God.” When God tells me who I am, it changes the way I live…bringing an end to all this striving, if nothing else. What seemed absurd to me as I was dishing out all my presumptions to him was the image of a father listening to his son go on in a similar manner. Sure he listens, for a while. But in the end, the father knows better than the son the son’s identity, and the core of what it means. I know far too many people who, when the facade is gone, really tend to hate themselves. Not only this, but their hatred tends to define who they are and how they act, what they are worthy of or not, etc. What we believe about ourselves often determines how we live. And most people, who hate themselves, live poor lives, destructive lives. They hurt themselves because they think they deserve it. They hurt others because they think they don’t deserve them. If you read Dietrich’s words about himself – hypocrite, weakling – you might conclude he falls into this category. Or it might be in the dismissive ness of what others say about him that his poor opinion of himself stands out. But, when it is all over, neither his nor other’s opinions are what make him. It is God’s that counts. Oh, and if you think yours and mine circumstances are different and therefore justified in the claims we make, remember that he wrote this poem after years of being imprisoned and tortured by Nazis. Circumstance isn’t an excuse for poor living, and self-abasement. They say that when Bonhoeffer was led to the gallows, he went boldly, putting the noose around his own neck. Was he resigned as a one defeated, “hurting” himself? OR was he sure and certain as one loved, free to go not so quietly, but firmly into that dark night? He knew whose he was and let this dictate WHO. The result? He did more to change the world around him in a few years than most do in a lifetime under easier circumstances. But it all started by having the world inside him changed.